Have you noticed that my posts have a love thing going on this week? I definitely love to win. Last month (yes I'm a little behind) my doorbell rang and when I went to answer it there was no one there. I looked right, I looked left, I waved to my crazy neighbor, I looked down, and there it was. A box. It wasn't a lamp made out of a plastic leg. It was so much better. It was a beautiful burlap wreath. I would have taken a photo of the box, then a photo of how beautifully it was wrapped, and then a photo of just the wreath, but we're talking about me, and I felt just like it was Christmas morning and I wanted to tear right into it. and it is my favorite thing this week. Oh and where did I get this fabulous wreath? Why from Laura (don't you love her name ) at Top This Top That. Be sure and pop over to visit her, because she has a tutorial on her blog showing how to create these beauties. compliment to your vintage style! Oh Laura- I just love it!! :) I am so glad that you are enjoying the wreath. 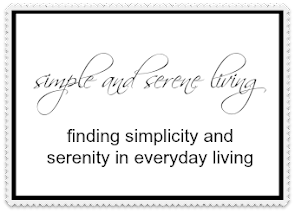 Well of to look around a little more on your blog and maybe visit with you on interest as well! best regards from K in Oslo, Norway! Lucky you! What a great little vignette you made. I would have done the same thing, ripping it right open and finding the perfect spot for it. Love that! Have a great weekend! How nice! Will pop over to her blog. Congrats on the win, and it's such a nice feeling when you win. 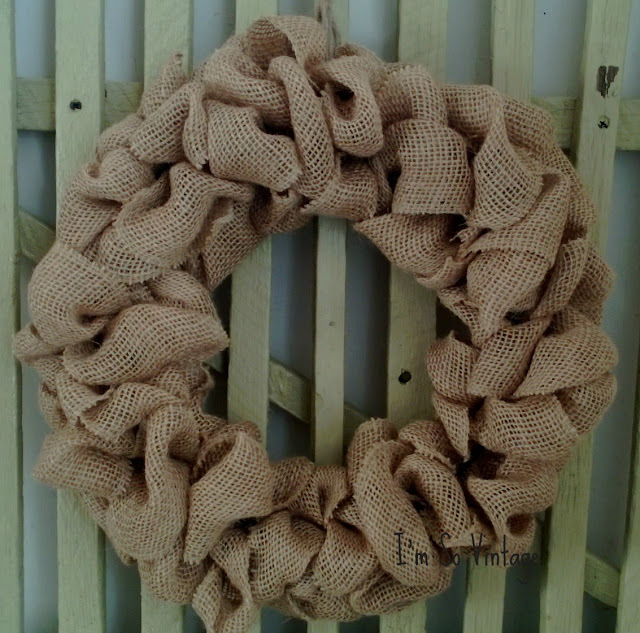 What a lovely wreath, one of the nicest burlap I have ever seen. I love to win something also and wow on this win for you! Gorgeous wreath and perfect in your vignette! Looks great on the picket fence. I have been lucky myself to win several things. If you want to win a handmade necklace, stop over and visit me, my neice's are having a giveaway! yeah you-what a fun surprise! Gonna pop over and see how she does that. I see so many burlap projects that I love, but I don't think they work with my house. Your wreathe is the first. I wish school didn't start back up on Monday because I want to make it, but no time. What a happy start to your day. 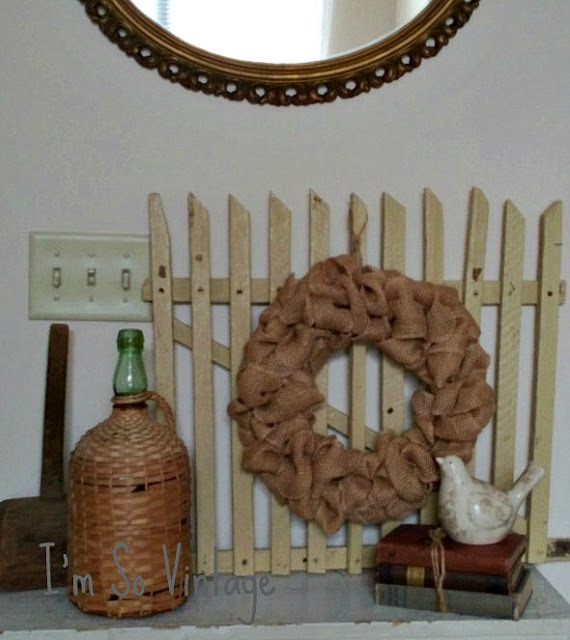 Love your mantel with your new burlap wreath. I'm so glad you won the wreath! It looks perfect on the picket fence. 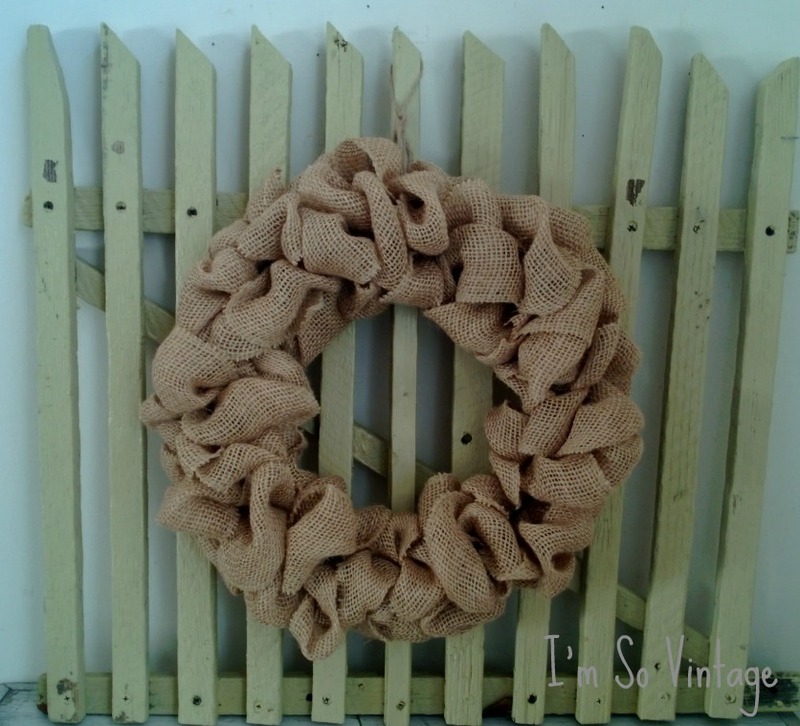 I'm loving burlap more everyday. Wonderful place to display it. Very nice burlap wreath!! You can add red ribbon for valentine's day, then add green ribbon for St. Pattie's day, then add red, white & blue to make it a patriotic wreath --- so many things you can do with your wreath!! Yippie, you won! Such a lovely wreath! (and so much lovelier than the leg lamp hahaha, you cracked me up). Enjoy! Nice wreath. I am a burlap lover. Just put burlap drapes in my living room last year. One of our friends is getting married and using a lot of burlap in her decor. I'll have to share this wreath idea with her.